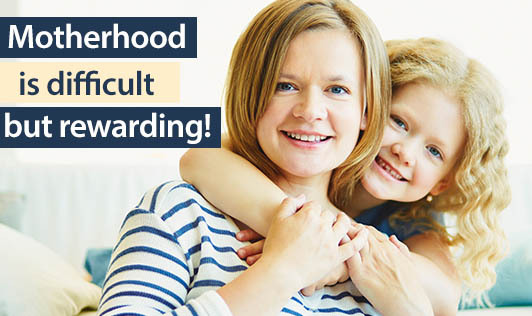 Motherhood is difficult but rewarding! The thought of becoming a parent is exciting, although it can mean adapting to a major life-change. It's common to feel unprepared, overwhelmed, worried and even scared. For some family members, this could mean a journey down the dark road of Postnatal Depression. .Postnatal depression also known as postpartum depression is usually developed within the first four to six weeks after childbirth. Postnatal depression is not a character weakness, and parents need to be aware that it in no way means that a mother does not love her baby. It is a clinical illness which occurs in about 1 in 10 mothers and the symptoms are usually there on most of the days for most of the time. Although some of these symptoms may be common after childbirth, they do not necessarily mean you are depressed. The exact cause for postnatal depression is not clear. Women are prone to develop it just after childbirth; causes may be due to stressful events after childbirth, worry and responsibility of the new baby. • Psychotherapy: Talking therapies such as Cognitive Behavioural Therapy.